I Dare You to Find Something Funnier . . .
than Grandmaster Wang's takeoff on Peter Finney. I don't want you to win that dare, because if I encounter something funnier, I will pull a groin muscle in laughing. 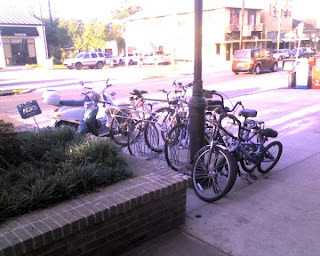 This is the bike rack outside Whole Foods on Magazine today. It used to be easy for me to find a parking spot for my bike when gas was $2.00 per gallon. Not so easy now that gas is over $3.50 per gallon. It cost me $80 to fill the Cliomobile yesterday (a Siena van that is somewhat necessary when you are transporting a fam of 6). 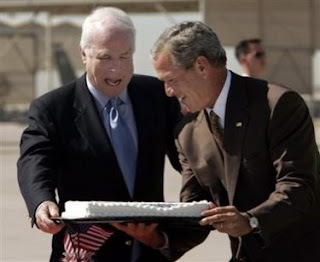 You know, back in 2000, when President Bush was coronated (is that a word?) by part of the Supreme Court, I thought to myself--Well, I'm not optimistic, but at least he'll probably keep the budget balanced and figure out some kind of decent energy policy. Dubya is awful because he's not even close to being good at things that Republicans are supposed to be good at. I am glad that more people seem to be riding bikes. 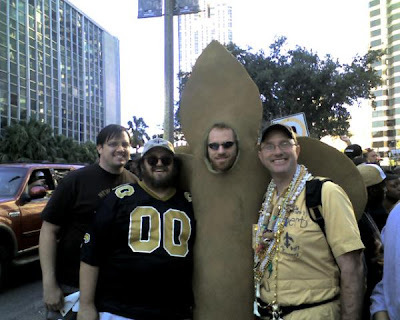 Imagine what Sundays before Saints games might look like this year. If you look at the banner at the top of Greg Peters' blog, you'll see a face that'll make you smile. Matt Forte Will be a Chicago Bear????? In a situation like this, it is important to remember that Professor Ashley Morris did have a sense of humor. He made this happen. I know he did. He's screwing with us. The Army Corps of Engineers Doesn't "Want People Thinking . . ."
"I don't want people thinking there's just a bunch of newspaper inside this wall, and that's the only thing keeping water out." Please note that this says nothing about the reality of our flood protection. It only talks about what the Army Corps of Engineers wants people to believe about flood protection. They don't want us to believe a certain thing. They never address the reality. The Corps guy says that three gaps in St. Bernard's flood protection were the only places where where newspaper was used. Based on their past performance (incompetence and lies), does anybody believe them? Jeffrey has some good stuff on this. This is nauseating and comical at the same time. Anyway, do we on the Gulf Coast really want a president whose birthday is August 29? Would New Yorkers want a president whose birthday is September 11? Tulane's Oliver Houck follows up John Barry. Governor Jindal, how about growing some and going after our "neighbors" to the North? They're killing us. Let us imagine a Louisiana that, instead of making excuses, faced the agriculture industry upstream and said: Stop sending us your waste or we'll take you to court. Imagine a Louisiana that would say to its own industrial dischargers: Let's get to zero levels, at least for toxins, so that we can recover the river that used to be, and can be again. So many Louisianans would benefit. I saw just a sample of them on Saturday. It was a thrilling moment. We can do this. Also in today's Times-Pic, be sure to read the letter to the ed from Entergy that gets surly with Chris Rose because he mentioned Ashley Morris's beef with Entergy's carelessness with New Orleans street corner tiles. --particularly those smug Midwesterners (not all, just the smug ones) whose lifestyles have decimated my homeland. Some of those same people want to see us plowed under. [The multibillion dollar costs to protect south Louisiana from hurricanes] are a federal responsibility because benefits to the entire nation, including massive engineering projects built in, and providing direct benefit to, states as far away as North Dakota, have in the last 60 years transformed New Orleans from a city reasonably safe from hurricanes to one dangerously vulnerable to them. These projects have had an effect as great as sending saboteurs from 1,500 miles away to dynamite Louisiana's levees. That analogy may sound like an overstatement, but it may be an understatement . . .
Human engineering has reversed [the natural land-building properties of river silt], causing the loss of roughly 2,000 square miles of land since World War II. If this buffer -- equivalent to the state of Delaware -- had not been destroyed, New Orleans would need little other hurricane protection . . . So far, policymakers have not seen the problem as a whole, and they largely perceive federal assistance as generosity. That's the wrong way of looking at it. Given that benefits to states throughout the Mississippi Valley actually created the problem, federal funding is not generosity. It's equity. Mayor Rideau of Baker, like thousands of others in the Baton Rouge area, stepped up for Orleanians when we needed it most. Orleanian Wilbert L. Ross Sr. said the obvious: “I really care more about the mayor of Baker than I do about Ray Nagin,” the mayor of New Orleans. Um, I hate to say this, but it's a MESS. 1. Congrats to the LSU Tigers, who beat the Tulane Green Wave last night at fancy new Turchin Stadium. It's the first time since 2000 that the Tigers have swept the Wave in baseball. This series has not had the same luster the past couple of years as it did a few years ago, but I have a feeling that next year, both teams will be back among the nation's elite. 2. Please note something: last night's Tulane-LSU baseball game occurred just up Claiborne Avenue from the New Orleans Hornets' crushing defeat of the Dallas Mavericks. Both games started at 6:00 p.m. Both games were completely sold out. All of this happened a few hours after New Orleans hosted the presidents of three nations. Not bad for a city not good enough to host a presidential debate. World class--and we're just getting warned up. 3. I'm taking Cliette and her friend to Jazz Fest on Friday. Cliette is a big Sheryl Crow fan. So I am I. Although I think we have different agendas in going to see Ms. Crow. Ahem. 4. Still no sighting of Smartie. No smell yet either. 5. The T-P ran a headline today buried in section A about 36 shootings in Chicago over the weekend. WWAB? 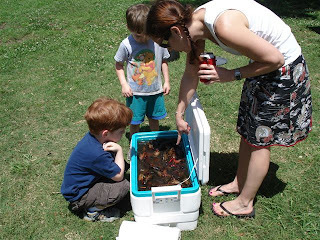 Smartie the Crawfish lived up to his name and escaped overnight. He was last heard scratching around somewhere in the living room. This has nixed Clio IV's plan to bring him to school today. I hope to find Smartie with my eyes in the next 24 hours, but I have a feeling I'll be finding him with my nose in about a week. Crawfish at the Fly. The live ones provided hours of entertainment. There is still one very lucky crawfish alive at my house. 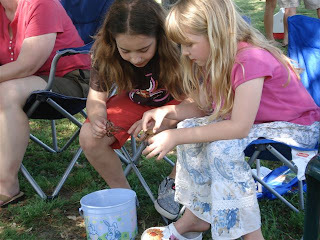 Cliette and Clio IV consider what they're doing to be "taking care of" Smartie the Crawfish. That characterization is open to debate, however. Walgreen's, why do you sell those individually wrapped pickles near the checkout? More important: who buys them? Pregnant women? While you're thinking about that, enjoy this song, which I can't get out of my head. It's not an unpleasant plight. "New Soul" indeed. Chris Rose Might Not Be a Douchebag. NOTE: Edited to save somebody some trouble. Pencil in Dec. 11 on your calendar. Do it for Ashley. On December 11, on national television, we play that team from that city where Ashley taught. The Saints need to administer a severe beatdown that night, for their own pride and--critically--for Professor Ashley Morris. You know what to do, Will Smith. A reasonable documentation of why we all love the Terrace. WWAB: What Would Ashley Blog? Here's a picture someone forwarded to me. It's the Mississippi River near Williams Boulevard in Kenner. Rather than opening the Spillway, I suggest that we dynamite the levees just above St. Louis. That would increase the silt levels in the river down here in Louisiana, which would help us restore our wetlands. Oh. Would that have some other, um, effects? Sorry, but it's time for us to take care of ourselves, instead of letting the residents of the Upper Mississippi River systematically destroy our homeland. We Did Our Work and Sent Him On. Fare thee well, Dr. Morris. We will see you soon. We will fight on harder because of you. Ashley's body will join my grandfather's and many other passionate and unique Orleanians in St. Louis Cemetery #3 today. That piece of geography will get even more holy today. We are all getting stronger today, too, with bonds sealed in Ashley's fire. It's Already Started, and It Ain't Cool--or Is It? As I've fought through the haze of the past week, one of my fears about Ashley's departure has already come true. It's a selfish fear, but here it is: how I will feel when I go to events or places, and the big man ain't there. 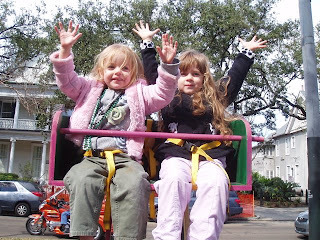 It happened Saturday at the Lusher Crawfish Boil. I first met Ashley in person at the Lusher Crawfish Boil two years ago. This year, he wasn't there. It hurt. Then, last night, I saw what the rolling impact of this man's non-presence will be like. For my job, I attended an awards dinner last night at Harrah's Casino Theater. At the end of the evening, I was talking to a few people, and I saw the sound and light crew on the stage, breaking down equipment. And then I noticed Troy, a neighbor from section 635, row 7, in the Louisiana Superdome. Troy and his wife, Kayla, have spent a lot of time together at Saints games with Berto, Ashley, Oyster, and me. I only see Troy at Saints games, and I hadn't seen him since the end of the season. I walked up on to the stage with a smile, shook Troy's hand. 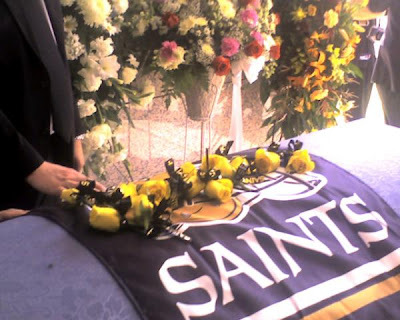 It was good to see a guy who has been around for a lot of happy times (Saints 20, Falcons 3), and some bad times (those miserable Saints games--all losses--in Tiger Stadium). Then, something happened. I got unexpected tears in my eyes, and just blurted out to Troy about what happened to Ashley. I guess it was ultimately a selfish thing to do, but honestly, it was almost involuntary. I just had to share it with a proud member of the fighting 635. Troy looked like I had punched him square in the nose. He teared up. He made a short gasp for breath. We both chilled out quickly, but it wasn't fun. This is going to keep happening, too. It hurts, but it's a sign of what kind of mark a good person can make in the world. In the end, it's inspiring. P.S. You can see John Pope's excellent memorial article about Ashley Morris here. Ray Shea and Mark Moseley obviously had a great role in the crafting of this article. New Life. Good. We Need Some. Mrs. LatinTeacher and LatinTeacher are parents!!! She did all the work, and gave birth to a 6 pound, 10 ounce baby boy. LatinTeacher will take all the credit, I'm sure. Although this child lives in Pennsylvania, we will school him in the ways of the Black and Gold. Go here: Remember Ashley Morris. Photo from Ashley's blog, February 2007. Ashley passed away yesterday. I'm in shock. UPDATE: You will notice in my blogroll, which I created long ago, I labelled Ashley "The Inimitable." It didn't take more than three seconds to come up with that descriptor, and it holds up really well. When his children are older, it will be difficult to describe him to them. What are the comparisons? But we will all try, because they deserve it.